We have just finished compiling all of the frequently asked questions for the past 40 years. 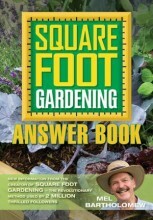 The new book is titled Square Foot Gardening Answer Book. It’s amazing to see how many similar questions people ask and usually I can tell whether they’ve read the book yet, or not. Of course, we all tend to jump right into it and ask questions first. I’m not sure why. Perhaps we think maybe the book won’t contain all the questions we have and all the information we think we will need. I found from the past that if you think ahead a little bit, quite often you can answer your own question, and then all you need is confirmation. For example, on page 48 of the new ANSWER book, someone has asked, “I have several SFG boxes and I’d rather not pay for landscape fabric if I don’t have to. Can’t I just use a layer of newspaper or even cardboard under my SFG box?” What would you tell that person? What’s the purpose of the landscape fabric? Well, it’s to keep weeds from sprouting from the existing ground up into your very healthy Mel’s Mix and into your garden. Do you think a layer of newspaper is going to stop that weed? What’s going to happen to that newspaper when you water your garden? And what’s even going to happen to cardboard after about one month of watering? Obviously they are both going to disintegrate and then there is no barrier to the weeds from crowding into your garden. Yet despite this obvious thinking, I’ve read other garden writers who recommended laying down cardboard to kill your grass and stop your weeds. We even suggest you put newspaper and cardboard in your compost pile. It won’t take long to disintegrate and join everything else that is decomposing. Heres a case where you don’t want to economize. Now you know that I’m very frugal, but sometimes it doesn’t pay to be frugal: it’s foolish. I hope you’ll enjoy this new ANSWER book: it’s not only all about FAQ’s, but we’ve included many other thoughts and ideas in the book. For example, it tells you what kind of flowers to plant for attracting birds to your garden, and the 10 commandments of Square Foot Gardening, which starts out with #1: Thou shalt not waste space with a large row garden. We’ve also included an SFG timeline, showing you what’s happened through the years since 1975 when I organized my first community garden and introduced Square Foot Gardening to the public. Don’t forget all of our proceeds go toward local humanitarian and educational projects. Hello! I really like this blog. Please tell me – from where do you have information for ths post? From 40 years of experience doing the Square Foot Gardening System. I’m constantly experimenting, trying new things, also trying new things other people say, “This might work” and if it does, then we’ll put it into the Square Foot Gardening System. But most of it has been by my own experimenting, trying this and that and a little of everything. It’s also based upon answering a zillion questions about “How to SFG” over the past 40 years. as you can guess, people come up with the darndest questions, but I treat every one as a question that needs an answerand sometimes it may mean a slight adjustment to the system because its not as clear and as simple as I imagine it. This is quite often the case where you’re dealing with a very beginning type person in gardening. I want to make it as simple and easy as possible for everyone to have a garden. No excuses. No excuses anymore. That’s what I want. Everyone should garden. In fact, we could wipe out world hunger if we could get every family to garden. I hope that answers your question. If it doesn’t, please give me a little more detail of what you’re asking. I’m a recent devotee of SFG and am sold on your method. The brilliance of it lies in it simplicity. I do have one question that I have not yet been able to answer. I’d like to grow a 4×4 garden with half of it devoted to tomatoes and the other half peppers putting one to each square. Does it matter if i put two rows of tomatoes next to each other or should i alternate between tomatoes and peppers? Or am i missing the point and should be varying the contents of the 4×4 more than i am? In answer to your question, are you missing the point of planting a crop in every square foot, in your situation, I would say the answer is yes and no. Normally a person would have two or three pepper plants in their whole garden, not 8 or 10. So it’s best to space them out for several reasons: one is pest and disease protection, another would be for staggered harvest, and a third would be just for good looks. Remember we are looking for a quilt look to our garden. However, if you want a lot of one thing, as you do of peppers, then they can all be placed together, even different varieties, so it makes harvest easier, and this is all laid out in my second book, CASH from Square Foot Gardening. The idea of that book is to raise a crop to sell, as if you were a farmer, not a home gardener. In that case, you want a large harvest all at once to go to market. If you read that book you will see that an entire 4×12 bed was planted with one crop, either all at once, if it was a summer fruit crop, or the harvest was staggered in a wave action, if you wanted a continuual cool weather crop, so that also depended on the harvest you were looking for. Concerning the tomatoes, if you’re planting a bush variety, if you’ll check the book, you’ll see it needs a 3×3 area. The only time we plant one tomato plant per square foot is when we trim that plant to a single stem and grow it vertically up a tomato frame. I’m not sure what kind of tomato plant you are growing, bush or vine, but in a normal 4×4 you could plant 4 tomato plants along the north side where you have a tomato tower, or trellis, to grow them on. So use that knowledge to decide how you want to space your tomato plants. As far as how many plants fit in a 4×4, we don’t call them rows, even though 4 squares are in a line and I could see you planting an entire 4×4 bed of just peppers, if you want that many, one per square foot or you could combine, if you’re going to grow bush tomatoes, you’re going to use 3×3 for one tomato plant and let it grow very large and then you would have along the two outer ledges 7 more square feet and you can arrange those to fit your peppers. Draw a picture of a 4×4 square bed with 16 squares and you can see much better how many plants can be put in a 4×4. Just keep in mind the spacing for peppers is 1 per square foot. For bush tomatoes, one per 9 square feet (3×3) and for vine tomatoes grown vertically along the north side of the bed, 1 per square foot. That sure is a lot of numbers and it might be confusing until you make a simple drawing and then it will become crystal clear.